Today, we’re excited to launch the first of our CHA releases! We have FIVE new Ai People, perfect to add to your collection. To start off, our design team has amazing creations on their blogs to share. Hop on through the blogs for some awesome inspiration and join our raffle to win the ENTIRE line! Start at Art Impressions and hop through our Design Team! A simply gorgeous card, Crystal! 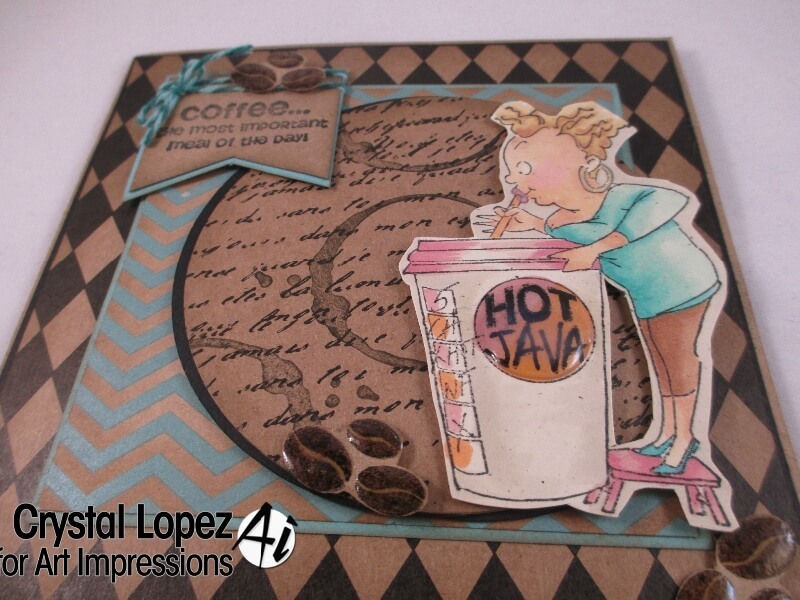 You always make the best backgrounds – I love your coffee beans and coffee cup stains! 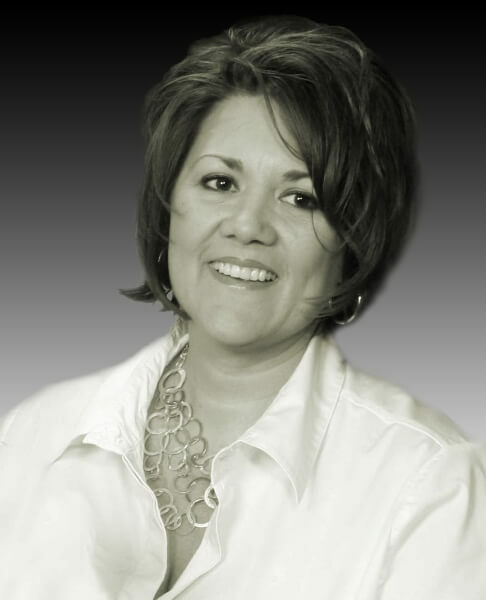 Cathy may have Hot Java, but you are Hot in Creativity! So many details – love it all! That’s me! The java junkie! Love it! Beautiful card and fun too. Wow! Love your card. The background and the colors you used are wonderful. Crystal you have done a great job with this stamp. Love your work. 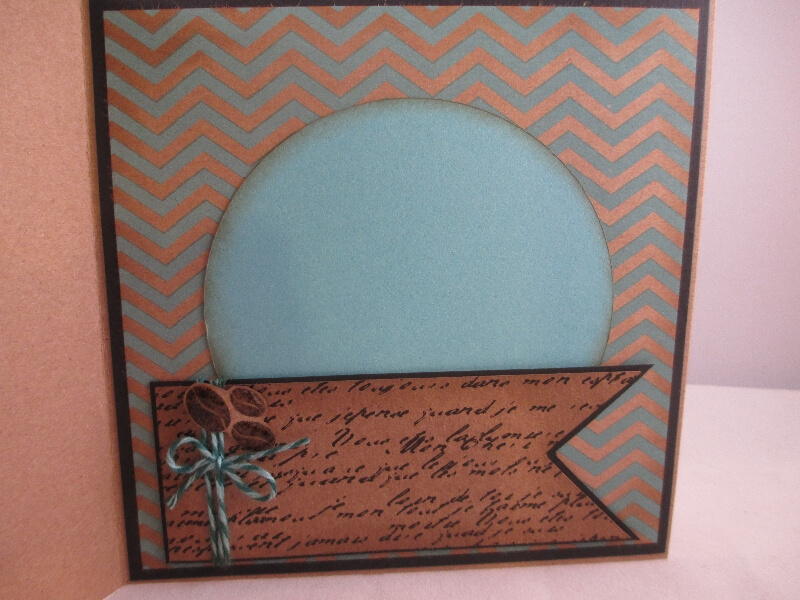 Beautiful design and colorization on this card…AI creations are always a hoot! Great card–i like the coffee stains. Super card. It really gives you that coffee feel with the beans, cup stain and the Kraft cardstock. Love the new images. That electrified hair is a hoot! 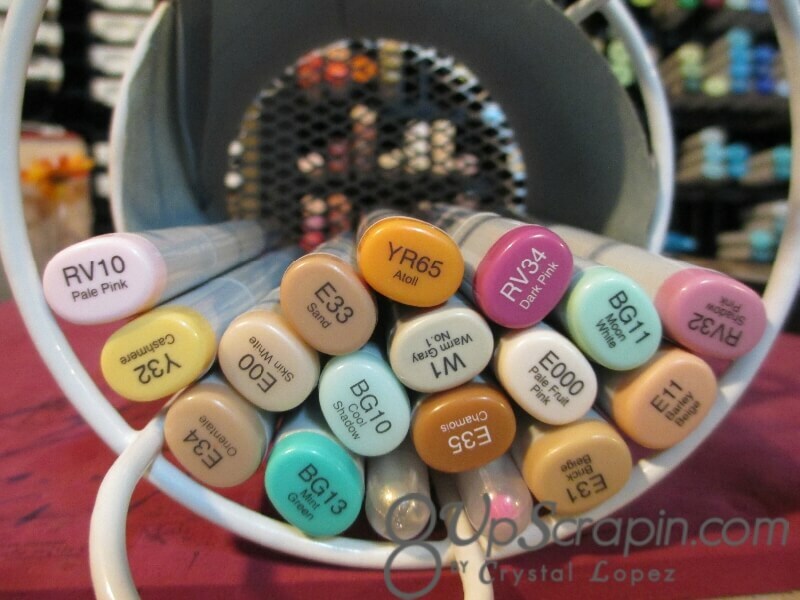 wow, cool card, love it, love the coloring, love that you show the copics that you use on your card. sooo cute, love that stamp, my favorite. with love from tracey M from Syr. N.Y.
NICE! A very different take on the colours compared to the previous blogger but very awesome — warm and rich, just like a good cuppa joe. Love that you used DD colours! I love your colors!!!!!!!! These stamps are awesome, all of them!!! Wonderful! I love the kraft/browns of your card .. and the coffee stains!! Brilliant!! Such a fun card, this image is SO ME – absolutely love this – TFS! Oh so fun! 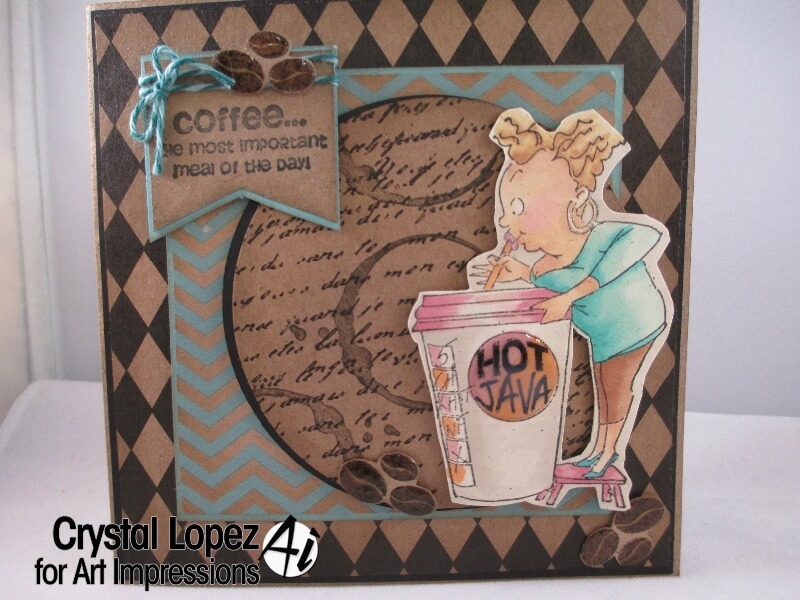 What a brilliant card design – I love the coffee stains and the use of brown/krafts! She is a cutie – love how you combined this to create a masterpiece! SUPER FUN!! TFS! Love your blue & brown combo!! Nice touch with the coffee beans, and great coloring!! Wow. Crystal. What a great card. Such a funny sentiment and image. I love it. Your colors and layers are wonderful. Great job. Great card, the colors are wonderful. Such a fun stamp set. What a super cute card! I must have that stamp! Your coloring is awesome. Thanks for the chance to win. Love the card and all the new people. I love everything about your card! 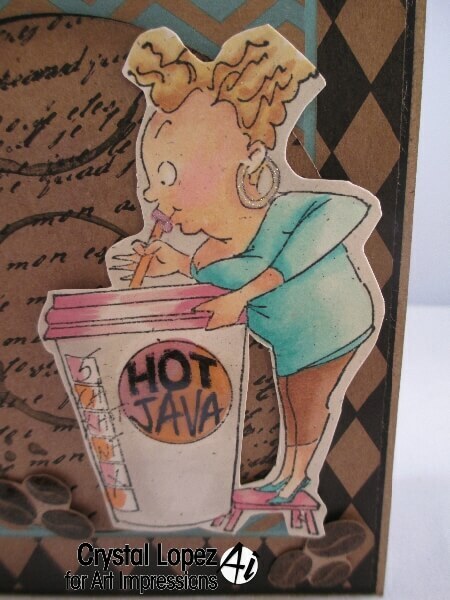 The kraft and black cardstock are perfect for a coffee card, and as a Cathy with a ‘C’ who totally LOVES her coffee I think this image is custom made for me!! I can’t wait to get her!!! A great way to end an awesome hop! Ha! I especially love the coffee rings you added! Super fun!!! Fabulous card – love this!